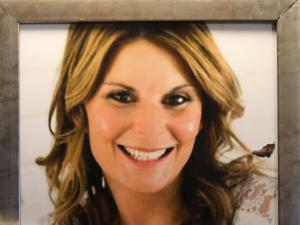 LOWELL — A Tewksbury mother who was active in her church and worked for a Cambridge design firm was killed Sunday in the massacre at the country music festival in Las Vegas, grieving family members said Monday. Rhonda LeRocque was at the outdoor concert with her husband, Jason, and their young daughter when a gunman opened fire, killing her and at least 58 others, according to her sister, Jennifer Zelenski. The husband and daughter escaped unharmed, Zelenski said. Rhonda LeRocque’s grandmother, Carol Marquis, said Jason LeRocque’s father had bought the family tickets for the concert. Zelenski said LeRocque and her husband were devout Jehovah’s Witnesses and involved in many of the church’s community service activities. Rhonda LeRocque also worked for the design firm IDEO in Cambridge, where one employee recalled her as the beloved “den mother” of the office who often brought homemade baked goods for her colleagues. Marquis said Rhonda and Jason LeRocque met about 20 years ago through their local Kingdom Hall, the Jehovah’s Witnesses’ house of worship. Marquis said she had encouraged her granddaughter to join the church when Rhonda was a struggling young woman. “I said, ‘Well, look I can help you, but you’ve got to abide by my rules and you can come with me, but you have to go to Bible study every week and have to go to meetings with me.’ And that’s what she did,” Marquis said. Zelenski said Jason and Rhonda LeRocque became respected members of the church. “They always were very helpful and I want to say mentors in a type of way — great people to talk, if you ever needed to talk and listen,” Zelenski said. As part of the church’s charitable activities, Rhonda and Jason LeRocque helped rebuild homes in Louisiana after Hurricane Katrina and in other places affected by natural disasters, Marquis said. Rhonda LeRocque had worked at IDEO for a decade, according to her LinkedIn page. Before that, she managed her own cleaning and organizational business. Marquis said she last spoke to her granddaughter a few days ago. She was looking forward to the musical festival, Marquis said. At a relative’s house in Lowell, a family member said LeRocque had led a “picture perfect” life. LeRocque would often host cookouts and was close to all the children in the family. “She did so much,” she said. At least 59 people were killed and more than 500 people were injured after the gunman, identified by police as 64-year-old Stephen Craig Paddock of Nevada, rained heavy fire down on a crowd of more than 22,000 as country singer Jason Aldean was performing. Michael Kuenzler, a retired Lowell police officer who runs a restaurant and golf course in Dracut, said he and his wife were staying seven floors below the shooter at the Mandalay Bay hotel. Kuenzler, who was in town for a wedding conference, said he heard sirens and looked out the window to see a wave of law enforcement officers descending on the strip. “I’ve never seen so many police cars and emergency vehicles,” Kuenzler said. He said SWAT officers later checked their room during their sweep of the hotel and told the couple to stay where they were. can be reached at mlevenson@globe.com. Follow him on Twitter @mlevenson. Aimee Ortiz can be reached at aimee.ortiz@globe.com. Follow her on Twitter @aimee_ortiz.